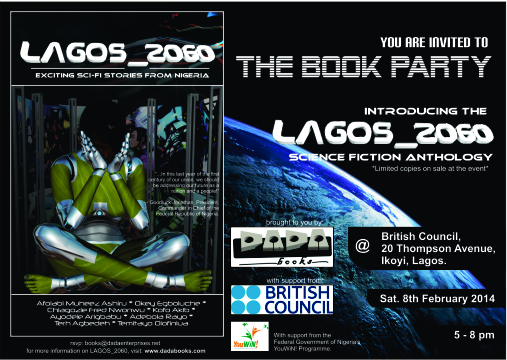 We're having a book party to welcome the LAGOS_2060 sci-fi anthology published by DADA books to the universe. It's a party, so come prepared to dance and of course, you've got to buy loads of copies of the book as gifts for people. It's happening at British Council, at 20 Thompson Avenue, Ikoyi Lagos, on Saturday, 8th February, 2014, from 5pm. This Book Party is brought to you by DADA books and is supported by the amazing people at British Council. Visit www.dadabooks.com for more information on LAGOS_2060. Like to purchase the book in advance?